Come by La Fonda for happy hour now available weekdays from 2pm to 7pm. All drinks -- beer, wine and spirits -- discounted. And try our signature sangria, margaritas and fantastic mojitos as well. Good food, good friends, and good spirits always at La Fonda, en el corazon de El Barrio! La Fonda congratulates long-time friend Pedro Angel Rivera Muñoz on the debut of his new film, "Desalambrando," now currently playing at The Fine Arts del Popular Center in Hato Rey, PR. Based on the book by Liliana Cotto Morales, "Desalambrar," the film is a narrative about the social struggles for housing and land during the 20th century, known in Puerto Rico as "rescates de terrenos," and their relevance to our present. It is contextualized within the history of the lands' appropriations from Spanish colonialism to U.S. patterns of "coloniality". Simultaneously, it is a historical document and a passionate testimony of the resilience, creativity and organizational abilities of the Puerto Rican people in the face of adversity. The film reveals the impact on the island of social processes in the United States. The type of land seizures that it documents are a form of collective actions also found in countries of the Great Caribbean, Latin America, Africa and Asia. Texas and Florida have fully recovered from Hurricanes Harvey and Irma thanks to a swift response from the federal government, but Puerto Rico does not yet have access to the resources and tools it needs to rebuild from the devastation of Hurricanes Irma and María. Puerto Rico experienced the largest blackout in American history and many are still in the dark. It has been 10 months since Hurricane María made landfall and we still do not know how many thousands of lives were lost during the storm and in the aftermath. Power4PuertoRico came together to make sure that their stories do not disappear from the headlines, to raise the voices of Puerto Ricans on the Island and mainland. Rebuilding Puerto Rico for the long-term will require continuing action from federal, state, and local governments. Join us in holding them accountable so we can build a stronger and more resilient Puerto Rico. Last Thursday was Awesome! Jeremy Bosch rocked some Boleros that Surprised the Audience. Billy Carrion Sr. laid down some Old-School Sentimiento while Billy Carrion Jr. tore it up on Bari Sax! Couple of Cats from PR dropped by and it turned into the Rumba of Doom. I could go on, pero, Si Quieres Sabér Lo Que Hay, You Gonna Have to Come By! This Thursday promises to be Another Incredible Night Of Music; Jazz, Bolero, Rumba, whatever, Because We Are Not Defined By Any One Type Of Music! Mente Abierta, Corazón Contento! - Dave "Dr. D" Feliciano. April 19th saw the return of Latin Jazz Nights at La Fonda, and what a night it was. Trumpeter Pete Nater's Latin Jazz/Salsa Jam inaugurated the resurrected tradition with a night of fantastic music, featuring the incomprable Ray Martinez on bass, Yeissonn Villamar on piano, Bobby Allende on timbales, Anthony Almonte on congas and a host of surprise guests who came out to jam, including El Barrio's own, sonero Frankie Vazquez. Latin Jazz Nights are organized by producer and sound engineer, David Feliciano, the audio alchemist and talent coordinator behind the great performances at La Fonda's FB Lounge a decade ago. It's all happening Thursday nights at La Fonda, where it all began, in El Barrio, NYC! To all those interested in donating toward relief efforts in Puerto Rico, Mexico and the Dominican Republic, The Hispanic Federation has set-up a special fund for this purpose. Visit them at: http://hispanicfederation.org. The Saturday before the parade is the 116th Street Festival right here in El Barrio. The 116th Street Festival has become the largest street festival celebrating Puerto Rican culture in the Northeast, if not the entire country. And La Fonda has, for the past twenty years, been a favorite hot spot of many festival-goers in search of good music, good food and good spirits. Because of the huge numbers of folks that show up, we must go into "festival mode," which means having to serve on disposable dinnerware for the day (so apologies in advance). But the portions remain the same and the flavor, classic as always! Doors open at 11AM. For more about the festival, check out this great little piece by Julio Pabon ..
Y Que Viva Puerto Rico! On January 6, 2016, legendary trumpeter and long-time friend of La Fonda, Alfredo "Chocolate" Armenteros, passed away. Born on April 4, 1928, in Santa Clara, Las Villas Province in Cuba, Chocolate's career spanned six decades, playing and recording with countless artists, including such giants as Tito Puente, Ismael Rivera, the Palmieri brothers, La Sonora Matancera and the great Arsenio Rodriguez himself, arguably the founding father of what today is known as "salsa". From the day La Fonda opened its doors in 1996, Chocolate made it his second home, filling it almost daily with his unique brand of humour, style and warmth. When the FB Lounge opened across the street, he quickly became its adopted patron saint, frequently delighting audiences with surprise appearances on stage, gleaming trumpet in hand. Both stately and familial at once, his presence was always a welcomed one. We will never forget the great stories he told and life wisdom he shared. It was impossible to be greeted by this man and not be overcome by the need to smile. Chocolate died on a day when, in East Harlem, the kings of the Epiphany are commemorated and where this wonderfully written tribute (below) by Aurora Flores begins. It is a fantastic profile of a man who enriched the lives of many through his music, charisma and personal story. And we feel privileged and honored to have been a part of his life here in El Barrio. Gifted pianist, composer, arranger, and long-time friend of La Fonda, Pablo Mayor, brought his band, Folklore Urbano Orquestra, to East Harlem and shot this video, performing "Siguiendo la clave" right here at the restaurant. The hardest thing about New York City is finding something that already exists. Its easy to be in the know about the trendy, new restaurant thats covered by all of the publications. And the vintage staples are favorites, keeping their original signs and attracting out of town clientele. Its the places that somehow fall into the in between that are tougher to find. The decades old, smaller restaurant serving really incredible food in a relatively obscure area. How do you Google search that? The truth is, you really cant. You need to rely on good recommendations from reliable sources to steer you in the right direction. For those of you who may have been wondering, all my artwork on exhibit at La Fonda is for sale. You can contact me at diogenes_studio@yahoo.com or call me at (646) 648-1249 if you are interested in purchasing Pensamiento Taíno or other of my pieces. As the cold comes rolling into New York City, we're turning up the heat. Come and taste La Fonda's new grilled ribeye steak, our chuletas kan kan (Puerto Rican classic thick-cut, rib-in, deep-fried pork chop), or for seafood lovers, our chillo frito (deep-fried red snapper). Check out our newly updated menu HERE. We hope you'll pay us a visit soon to see what's cooking at La Fonda! When Adam Richman brought his Travel Channel show Man Versus Food, to Harlem, he had to stop by La Fonda to have some mofongo! It was all part of a Man v. Food episode shot on location right here in East Harlem and Harlem proper. Thanks to everyone who stopped by La Fonda this past weekend to celebrate our rich, cultural heritage with music, laughter and the best Boricua cooking in town. We are proud to be the favorite place of so many during Puerto Rican Day Weekend in New York City. But the truth is that, at La Fonda, every day is a good time to celebrate our roots and enjoy the art, music and food of our rich culture. So we hope you'll stop by soon for a little piece of Borinquen, right here in El Barrio, NYC! La Fonda has always been known for the art on its walls. They have historically come from the generous contributions of such distinguished Puerto Rican artists as Antonio Martorel, Fernando Salicrup, Jose Morales, to name a few. In celebrating our re-opening, La Fonda is honored to feature the rich and enigmatic art of Diógenes Ballester. Diógenes produces and creates paintings, prints, drawings, new media and installation art. He is especially known for his mastery in encaustic paintings, an ancient painting technique that produces rich colors and thick impasto. 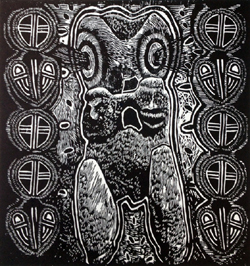 He has produced artworks in New York City since 1981 and is a well-recognized Puerto Rican artist in Puerto Rico, the Caribbean, and the Puerto Rican community of New York. For La Fonda, he has chosen to exhibit some of his finest works, each with its own unique story to tell. We hope you will stop by soon and experience it for yourselves, alongside a delicious meal sure to leave you wanting to come back again and again. Please visit Diógenes' website and learn more about this gifted artist and his many years of fine work. After way too long a hiatus, we are please to announce that La Fonda has completed renovations and is open for business, bringing you the classic Boricua cooking you've come to love. We're also proud to inaugurate our newly renovated space with the wonderful art of Puerto Rican artist, Diógenes Ballester. It's been quite a journey, and we appreciate all the love, support & encouragement we've received these past months. So, we hope you'll stop by soon and pay us a visit, right here as always, en el corazon del Barrio. our doors opened in 2008.
customers and extended family of supporters in New York City and beyond, who have given us so much love and support over the years. We also wish to acknowledge the contributions of music producer, sound engineer, and veteran of the world of Latin Music, David Feliciano, who was absolutely central to making all of the FB Lounge's perfomance magic happen. But, while we are saddened by the closing of this chapter in the story of La Fonda Boricua, we are excited about the next one: the re-opening of the original Fonda Boricua directly across the street from the FB Lounge, where it all began. months ahead as La Fonda Boricua completes its restructuring and renovation projects designed to bring you, our loyal customers, the very best we can offer. We apologize for these temporary inconveniences, and thank you for your understanding and support in the coming weeks. We look forward to seeing you soon right here in our little piece of Taino territory in the great City of New York, y En El Corazon Del Barrio. Pulitzer Prize and multi-Grammy Award winning trumpeter, Wynton Marsalis, made a surprise visit to the FB Lounge on December 18th, 2010, to join his friend, trombonist Papo Vazquez and his band, The Mighty Pirates. It was an incredible night of music, featuring Willie Williams on sax, Zaccai Curtis on piano, Dezron Douglas on bass, Alvester Garnett on drums, and Anthony Carrillo & Carlos Maldonado on percussion. A smiling Marsalis surprised the crowd already enjoying a fabulous performance by the always phenomenal Papo Vazquez, by walking up on stage towards the end of the first set. After enjoying a plate of rice, beans and sweet plantain during the set break, he delighted the crowds again by joining the band for almost all of the second set, taking, as one would expect, some of the hottest solos of the night. The night ended with an impromptu parranda of sorts, as all of the horns marched off into the cheering crowd while playing and swaying along with the traditional Puerto Rican Christmas songs being led by Vazquez himself. These are the kinds of things that are happening at the FB Lounge. And although some can be planned, many more often come to us by surprise. We hope you'll come and be a part of it soon! GRUPO FOLKLORICO Y EXPERIMENTAL NUEVAYORQUINO BRING THE GROOVE! On April 11th, 2010, the Fonda Boricua was honored to have the legendary band, Grupo Folklorico Experimental y Nuevayorquino deliver a spectacular performance at its FB Lounge. Arranged in association with musicologist, Rene Lopez, the musicians of Grupo Folklorico performed at no charge in order to assist the Fonda Boricua in raising funds to continue to support its musical endeavors in East Harlem. Singers Jorge Maldonado, Abraham Rodriguez and Pedrito Martinez shared soneo honors, each lending their unique voices to some of Grupo Folkloricos most well known tunes, while the grooves themselves were, as one would expect by a master bassist and musical director like Andy Gonzalez, simply solid. Percussionists Gene Golden, Jimmy Delgado and Tony Rosa rounded out the rich and robust sound of this phenomenal band, while founding member, legendary trumpeter, and FB Lounge celebrity regular, Alfredo Chocolate Armenteros, left us all with some of the evenings most crowd-pleasing moments. All of us at the Fonda Boricua would like to thank Rene Lopez and all of the musicians of Grupo Folklorico Experimental y Nuevayorquino for a night to remember. It was our privilige to be a part of this historic reunion of such talented artists and our fervent hope to be able to continue to bring such special events to our customers and the community of El Barrio. 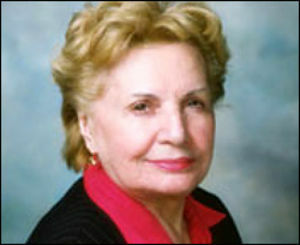 Olga A. Mendez, the first Puerto Rican woman elected to a state legislature in the United States, died July 29, 2009 at the age of 84. Ms. Mendez was born in Mayaguez, Puerto Rico in 1925. She received her Ph.D. in educational psychology in 1975, and was elected to the New York State Senate in 1978. "That's a lesson I carry with me every day, and one that's informed our administration's approach to everything we do, including the issues Olga focused on most acutely: educating our children, creating jobs, supporting small businesses, and developing affordable housing ... [D]iagnosed with cancer in the early 1990s, Olga didn't recoil from public life or attempt to hide her condition. Instead, she shared her story and her struggle with others. But Olga's legacy will live on with all New Yorkers who benefitted from this incomparable woman, who courageously broke barriers and overcame obstacles in her way." The Fonda Boricua extends its deepest sympathies to Ms. Mendezs family and friends during this difficult time, but will always remember the distinguished senator not only for her long and devoted service to our community, but the personal warmth and respect she always shared with us. 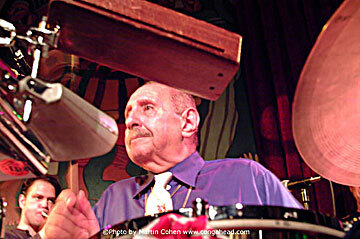 The great band leader, percussionist, and timbalero Manny Oquendo died on March 25th, 2009. The Fonda Boricua joins Mr. Oquendo's family, friends, and fans in mourning the loss of this giant of latin music. Mr. Oquendo was a salsa stalwart perhaps known best as the band leader and chief percussionist of Orquesta Libre, the band he co-founded with bassist and musical director, Andy Gonzalez. With a career spanning six decades, Oquendo has played with such greats as Tito Rodriguez, Pupi Campo, Miguelito Valdes, Johnny Pacheco and Larry Harlow. In 1950, he was the bongero for none other than Tito Puente. It was the Fonda Boricua's great honor to have had Manny Oquendo & Libre perform live at the FB Lounge on September 27, 2008 (see a short clip here). We are honored by the memory of this elder, and enriched by the wonderful music he has left us. Beloved musician and percussionist, Tavi Lopez, died on Tuesday, March 3, 2009. Born Gustavo Eliezer Lopez Rivera in Bayamon, Puerto Rico (November 6, 1953), Tavi was a gifted and versatile percussionist who has played with countless latin music greats, including Tito Allen, Adalberto Santiago and Jose Alberto "El Canario". He is survived by his mother Rufina Rivera Lopez (known by all as Doña Fina), his brother Herbert Padilla, and his daughter, Chanel Marie Lopez. Tavi was also a pivotal figure during the early days of live latin music at the Fonda Boricua (Latin Jazz Thursdays). His solid, well-anchored sense of rhythm, swing and clave was the foundation upon which so many memorable performances at the Fonda Boricua and FB Lounge depended. Tavi was a great friend of the Fonda Boricua. He was known not only for his talent but for his kindness, gentle nature, and immense humility. Which is why, while latin music may have lost one of its finest servants this week, we feel that we have lost one of our own. Jorge and I, along with the entire Fonda Boricua family, wish to extend our deepest sympathies to Tavis friends and family during this difficult time. the traditional bomba and plena musical forms from Puerto Rico, performed at the FB Lounge on January 29, 2009. (Check out this brief clip). Led by founder Juan Gutiérrez-Rodriguez, LP21 played two exciting sets of fantastic bomba and plena, and delighted the audience with their unique brand of story-telling, lyrical and musical improvisation, and just plain fun. LP21 has played in venues all over the world. They have performed from coast to coast in all of the US and Canada, and have even performed in Russia. Los Pleneros de la 21 is also an educational institution, performing in public schools and colleges as well as offering workshops to the general public every year. To learn more about Los Pleneros de la 21, follow the link below to their website. Washington, DC  January 23, 2009Congressman José E. Serrano and New York State Senator José M. Serrano mourned the passing of champion boxer and community leader José "Chegui" Torres this week. Torres won the silver medal in the 1956 Olympics in the middleweight category, and the light-heavyweight world championship in 1965. Using his fame, he later moved to a career of activism, writing and leadership. José Torres, who I knew better as Cheguí, was a personal friend, a role model, a mentor, and a hero to me, said Congressman Serrano. When I was young, we followed his boxing career obsessivelyhe was one of our most cherished Puerto Rican sports heroes, up there with the baseball greats. He brought us a great sense of pride and accomplishment as a community through his boxing career. Little did we know that his next step in life would be just as uplifting and important to Puerto Ricans. Cheguí next turned his attention from boxing to his second career: community activism and writing as a columnist for various New York papers. His primary concern was earning respect and equality for the Puerto Rican community, but he also was allied with all the various groups and communities in New York and was sensitive to their concerns too. He understood that we all rose or fell together.